KIEV, Ukraine -- Predictions that the war in Ukraine might be past its worst point can only be advanced with caution and caveats. Over the past 18 months, the western world has been consistently surprised by unexpected escalations and brutal events – from the annexation of Crimea to the shooting down of flight MH17 over eastern Ukraine. Last week, saw an escalation of conflict around Donetsk, with six killed in one day. And yet, for all that, a cautious optimism is growing in the west that the fighting may be past its worst. There are still armed militias on the ground and intermittent fighting continues. But, against expectations, the Minsk peace accords negotiated last February, seem to have succeeded in damping down the conflict. One well-placed EU diplomat calls the new situation, a “hybrid peace” – a play on the well-known idea that Russia is fighting a hybrid war. Two months of relative calm is a thin reed on which to build hopes of peace. But there is an argument that, for different reasons, President Putin of Russia and President Poroshenko of Ukraine may now have an interest in de-escalating the conflict. Both Russia and Ukraine face major economic problems that a war will only make worse. And further military gains could only come at a very high price. Military analysts have long been looking for signs that Russian-backed forces will attempt to take the Ukrainian coastal town of Mariupol – which would be a crucial to building a land connection between Russia and newly-annexed Crimea. Some recent western visitors to the region think they have seen signs that Russia is indeed preparing for an assault on Mariupol – and fighting continues close to the town. But launching a full-scale assault on a town of 500,000 people would risk a humanitarian disaster, without fully achieving the goal of establishing a “land bridge” – since two more regions of Ukraine would still lie between Russia and Crimea. That may be too much for Russia and its proxies to take on . Instead, Russia may also be exploring alternative ways of securing its goal of a non-aligned Ukraine, that does not formally or informally “join the west”. In particular, Ukrainian politics is still messy and prone to corruption. The Russians could now look to build influence in Kiev, rather than to launch another major assault in eastern Ukraine. However, it is pretty clear that any Russian respect for the Minsk accords is likely to remain very partial. 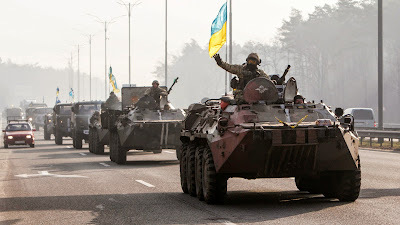 In particular, there is no sign that the Russians intend to seal the border between Russia and Ukraine – as Minsk demands – since a porous border allows them to maintain support for the pro-Russian rebels in the Donbass region. As for the Ukrainian government in Kiev, it too faces difficult choices. The “war party” argues that it is simply unacceptable for Ukraine to accept that – de facto – it has lost control of key parts of the country’s territory: not just Crimea, but also the Donbass. Others, close to President Poroshenko, argue that, without military support from the west, Ukraine is in no position to fight back. Instead, it should concentrate on economic and political reforms to rebuild the bulk of the country that Kiev still controls. For different reasons therefore, the governments in both Moscow and Kiev, may now be willing to give “hybrid peace” a chance.